You can allow Targets to select the people that will review them, their Raters. If you decide to let the Target's build their own Rater list you will also be given the option of whether or not to automatically approve that list or have an auditor review and approve it first. If you do allow Target's to select their own Raters you can always add/delete raters from the administrator tool as well. To turn on this functionality for your project, follow the steps from one of the options below. Login to your project and scroll down to Step 5 of the Quick Setup Checklist. By default, the project is set to allow the administrator to load the raters for each target. 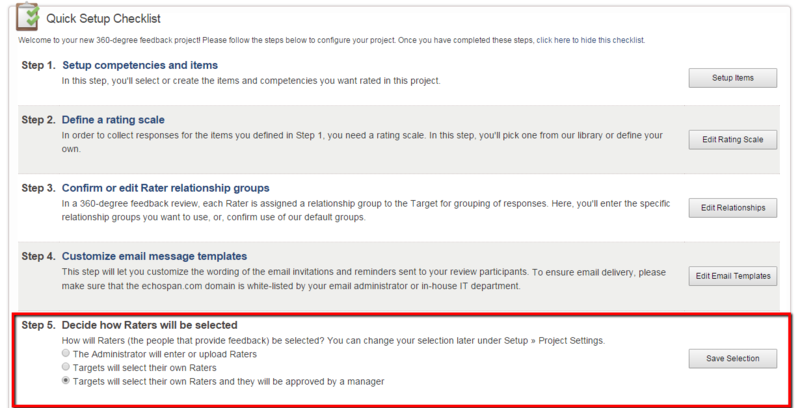 Choose "Targets will select their own raters" or "Targets will select their own raters and be approved by a manager". Choose "Self Select" next to Rater Selection. Determine how the rater lists are approved by choosing either "Automatic" or "Auditor-Approved". If you allow Targets to select their own Raters you will want to review the advanced settings associated with this option in the Targets and Auditors section of our Advanced Settings page. By default, the system will allow the Targets to select their raters and the Targets will not have to finalize their list of reviewers. The Raters will be approved to complete a review upon being added by the Target and an Rater review invitation will be queued for each as they are added. The administrator of the project will need to send out the emails to Raters. From the drop-down menu, select Setup >> Advanced Settings. Expand the Targets and Auditors section. Here you can turn ON the option for Target's to finalize their list of reviewers. If that setting is turned ON you will now have the ability to choose to allow Targets to send out invitations to their Raters upon finalizing their list, and choose whether or not their Rater list is editable prior to being finalized.